Model M (Morris) Flying-boat. 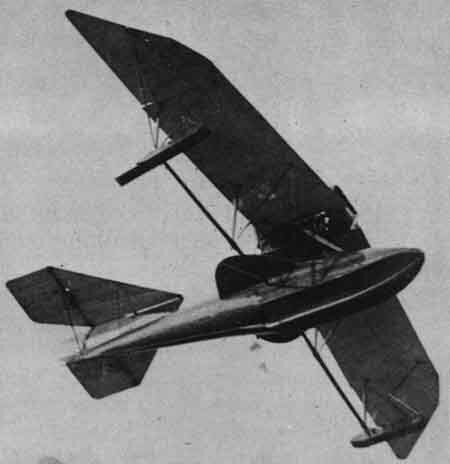 It is not known whether the M designation identifies the 1913 monoplane flying-boat built for Raymond V. Morris in the Curtiss letter designation system or is M-for-Morris; the 'boat, which predates both the J and N models, was referred to mostly as 'The Morris Boat'. 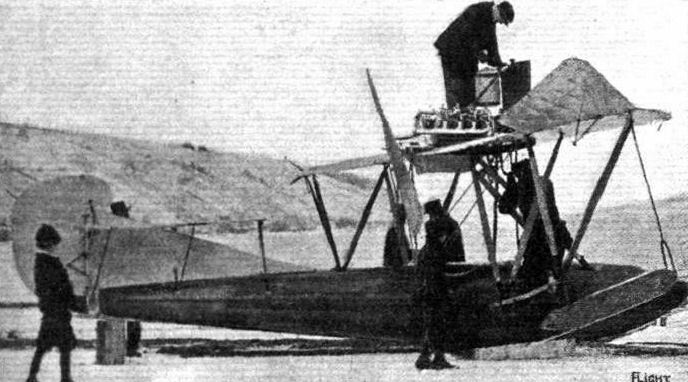 The high and swept-back wing was fitted to a narrow single-seat hull covered with mahogany veneer in the manner of later F-boats and the 90 hp pusher engine was carried at the level of the wing. The stabilizing floats were carried on the ends of trusses that also formed the wing bracing. Morris took the M-boat with him to San Diego when he became Curtiss's manager there. Its performance as a monoplane was unsatisfactory so a lower wing was added at San Diego. Span 34 ft (10.36 m); length 25 ft (7.62 m); height 10 ft 10 in (3.3 m); wing area 120 sq ft (11.14 sq m). Powerplant 90 hp Curtiss O. THE CURTISS MONOPLANE FLYING BOAT. AN extremely interesting machine has been turned out just recently at the Hammondsport factory, where the Curtiss machines are built. It has been specially built for Mr. Raymond V. Morris, of New Haven, Con., and differs very considerably from the other machines turned out by the Curtiss firm. In the first place, it is a monoplane; and secondly, the design and construction of the hull are new. Early in January its owner put it through some tests on Lake Keuka, New York, with very successful results. 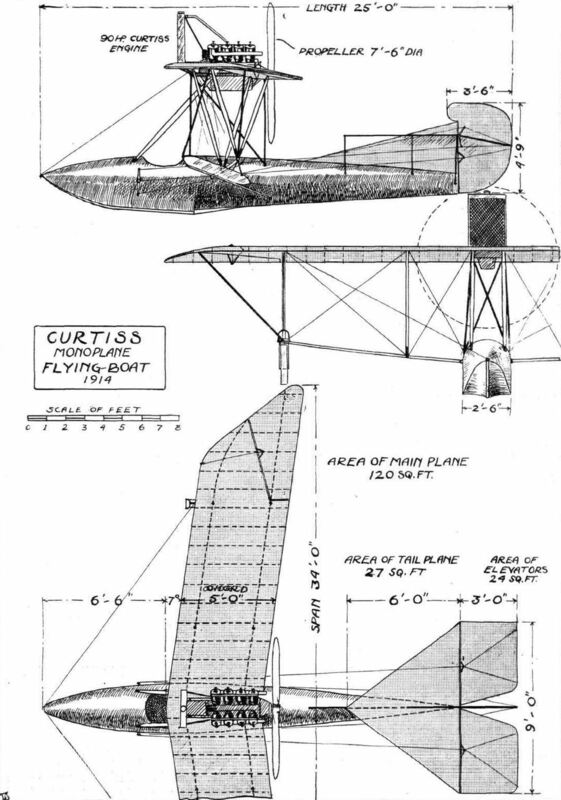 Perhaps the most interesting feature of this new Curtiss machine is to be found in the wings. These are of the form that is so popular in Germany, known as the "arrow plane," in which the wings are swept back so that in plan form they resemble an arrow-head. 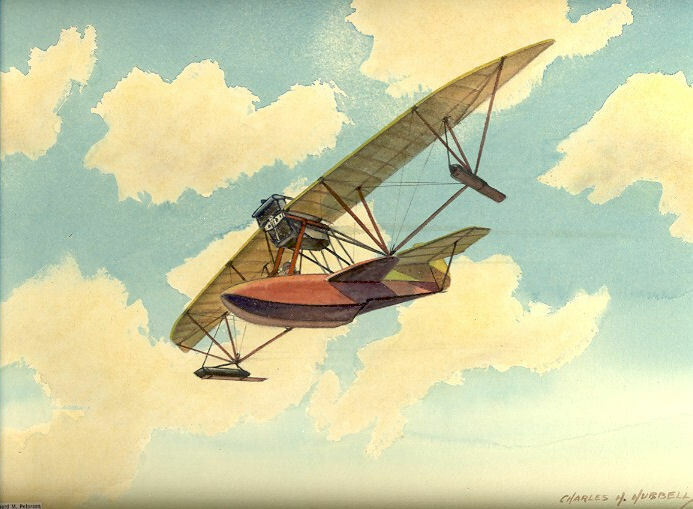 The wing section employed on this new machine is similar to that of the Bleriot XI bis and the B.E. 2, and the method of wing bracing is like that found on many of the "taube" machines in Germany. The wings are mounted some 4 ft. above the hull and are attached to a steel superstructure forming the engine bed, whilst the bracing consists of four pairs of "V" struts, two on each side of the hull, the apex of each pair joining a single transverse spar extending under the wings from each side of the hull. In construction the wings follow usual practice, being built up of two main spars with ribs spaced at intervals of about one foot. The leading edge of the plane curves rearwards at the tips to a point where it meets the ailerons. The latter are almost triangular in shape, and are counter-balanced, that is, when one goes up the other goes down. The tail consists of a triangular plane with two elevator flaps hinged to the trailing edge mounted above the stern of the boat, together with a vertical fin, triangular in shape, and a rudder. The engine, as previously mentioned, is mounted in the centre and on the top of the plane, the propeller being situated immediately at the rear of the trailing edge of the latter. The type of engine fitted is one of the latest 90 h.p. 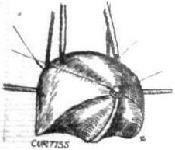 8-cyl. Curtiss OX models water cooled, with the radiator mounted in front on the leading edge of the plane. In addition to two pairs of tubular steel struts supporting the engine bed, a pair of stout wood struts extend forward from the engine to the hull to a point just in front of the pilot's cockpit, and serve to take the thrust of the propeller. In shape the hull is very like a torpedo, except that the stern tapers to a vertical knife-edge, and that the bottom from bow to about midships, where there is a step, is of the double concave type employed on the latest navy pattern Curtiss boats. The framework of the hull is built up of ash longitudinals and ribs. On the framework is a diagonal layer of 3/32 in. mahogany planking, and over this is a covering of heavy "Sea Island" cotton set in marine glue. Another layer of mahogany planking of the same thickness, but laid longitudinally, forms the outer covering. Immediately under the plane is the pilot's cockpit, the seat being placed low down in the hull in order to afford ample protection for the pilot from wind and spray. A second hole has been cut in the top of the hull, just behind the pilot, for a passenger, but when the pilot only is on board this hole is covered up. An auxiliary float is attached to each outer extremity of the transverse bracing spar. The control is of the usual Curtiss pattern, shoulder yokes for the ailerons, rocking column for the elevator, and foot-bar for the rudder. The principal dimensions of this new air-boat are as follows :- Overall span from tip to tip of ailerons, 34 ft.; span of wings, 28 ft.; maximum chord, 5 ft.; wings swept back 7; Supporting surface, 120 sq. ft.; length of hull, 22 ft.; maximum beam, 2 ft. 6 ins. ; maximum depth, 3 ft.; weight with pilot and fuel, 1,200 lbs. In view of the success of the new craft it is anticipated that the new model will prove to be very popular during the coming season. It will be remembered that Messrs. White and Thompson, Ltd., of Middleton, Bognor, are the representatives of the Curtiss firm in Great Britain. This single-seat Model M was built in 1913 for Raymond V. Morris, a Curtiss employee, to use in his work. 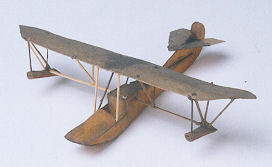 The performance of the Model M as a monoplane was marginal so it was converted to a biplane in Curtiss's San Diego shops. THE CURTISS MONOPLANE FLYING BOAT. - Plan, side and front elevations to scale.